“This evening’s Mosquito raid was particularly disastrous for me because our Ministry was hit. The whole lovely building on the Wilhelmstrasse was totally destroyed by a bomb. The throne-room, the Blue Gallery and my newly rebuilt theatre hall are nothing but a heap of ruins. I drove straight to the Ministry to see the devastation for myself. One’s heart aches to see so unique a product of the architect’s art, such as this building was, totally flattened in a second. What trouble we had taken to reconstruct the theatre hall, the throne-room and the Blue Gallery in the old style! With what care had we chosen every fresco on the walls and every piece of furniture! And now it has all been given over to destruction. In addition, fire has now broken out in the ruins, bringing with it an even greater risk, since 500 bazooka missiles are stored underneath the burning wreckage. I do my utmost to get the fire brigade to the scene as quickly and in as great strength as possible, so as at least to prevent the bazooka missiles exploding. …The Fuhrer telephones me immediately after the raid on the Ministry. He too is very sad that it has now hit me. So far we have been lucky even during the heaviest raids on Berlin. Now, however, we have lost not only a possession but an anxiety. In future I need no longer tremble for the Ministry. All those present at the fire voiced only scorn and hatred for Goering. All were asking repeatedly why the Fuhrer does not at last do something definite about him and the Luftwaffe. The Fuhrer than asks me over for a short visit. During the interview I have with him he is very impressed by my account of things. I give him a description of the devastation which is being wrought and tell him particularly of the increasing fury of the Mosquito raids which take place every evening. I cannot prevent myself voicing sharp criticism of Goering and the Luftwaffe. My bet? 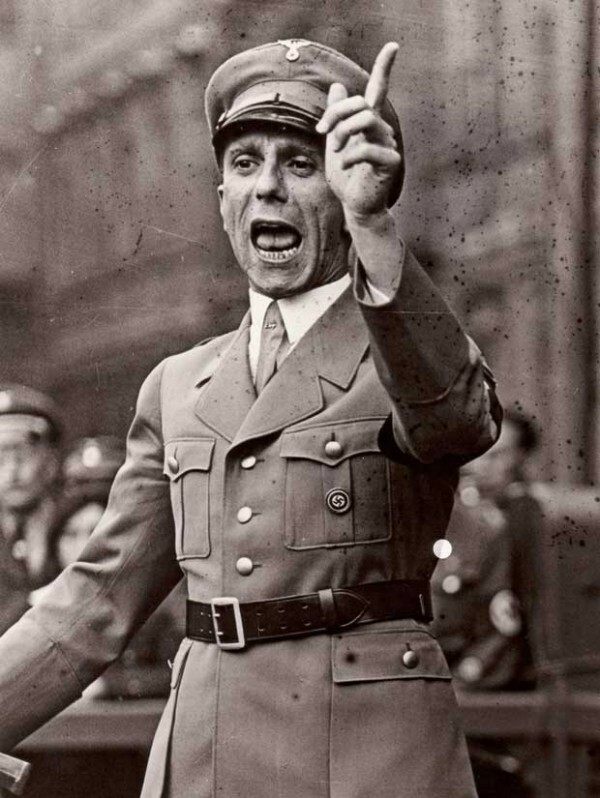 I, x 4,000lb ‘blockbuster’ = no more office space for Goebbels! It was amazing just how destructive a Mosquito raid could be. When the Light Night Striking Force put 100+ Mosquitoes over the Big City (usually as a ‘diversion’ from the Main Force attack elsewhere), Berliners counted this as a major raid.